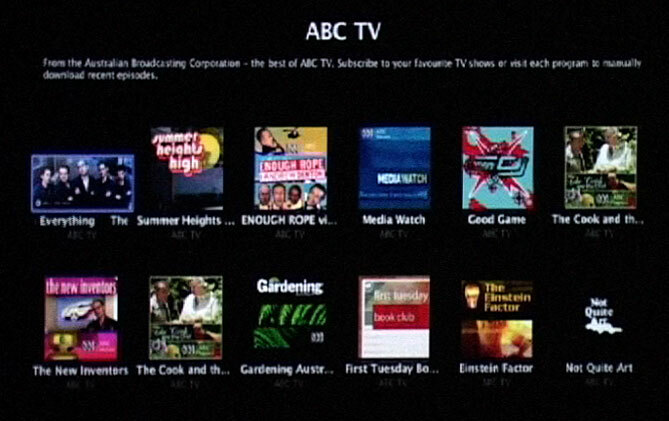 For the uninitiated, the AppleTV was Apple’s first attempt at a media centre. Essentially, it’s like a big iPod that connects to your screen and plays back movies, TV shows, music, and — best of all — podcasts. It was released in March of 2007 to a fairly mild reception. You can’t playback live TV, and weren’t able to download content directly from the device (this had to be done through iTunes), and the content you could put on the device had to be in a very specific format to work properly. Needless to say, it was no iPod, and even Apple admits it failed. Tonight, Apple released a major update for all future and existing AppleTV owners, and things have changed. 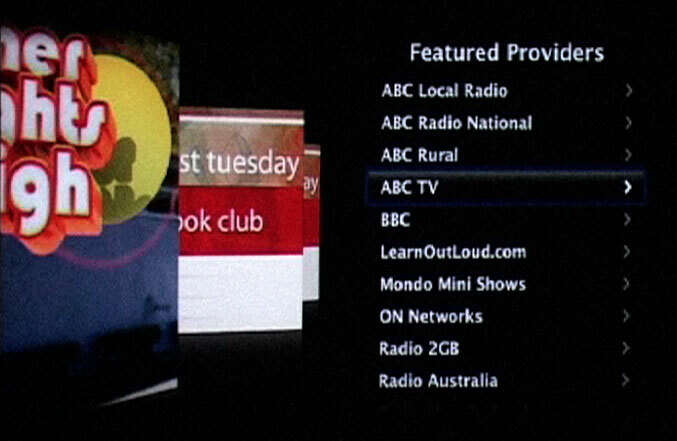 AppleTV’s new features, like movie rentals, remote speakers, and 1080p output have been covered in other blogs. What I want to focus on is what the new AppleTV means for podcast listeners and podcast creators, because I think we are going to benefit most of all. 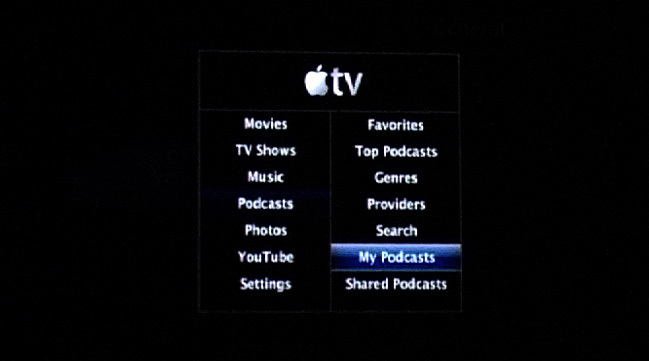 First and foremost, you can play podcasts you have downloaded in iTunes to your AppleTV and play them on your regular TV. Nothing much different here, but for those who have not seen it before, this is how it’s done. 1. Subscribe and download podcasts in iTunes, as you normally would for your iPod or iPhone. 2. 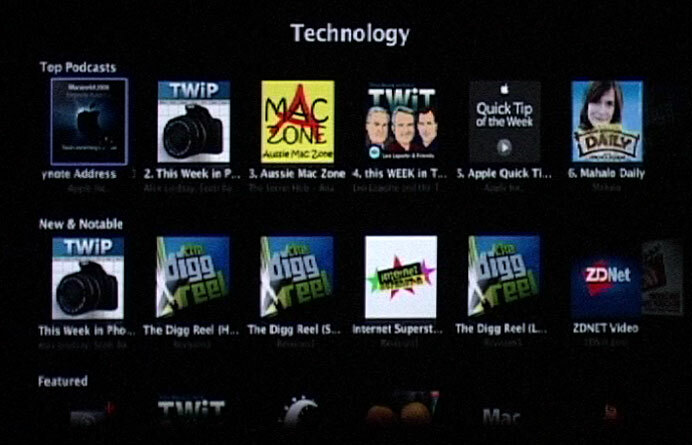 Automatically, though your wireless network, these podcasts will be sent over to the AppleTV. 3. 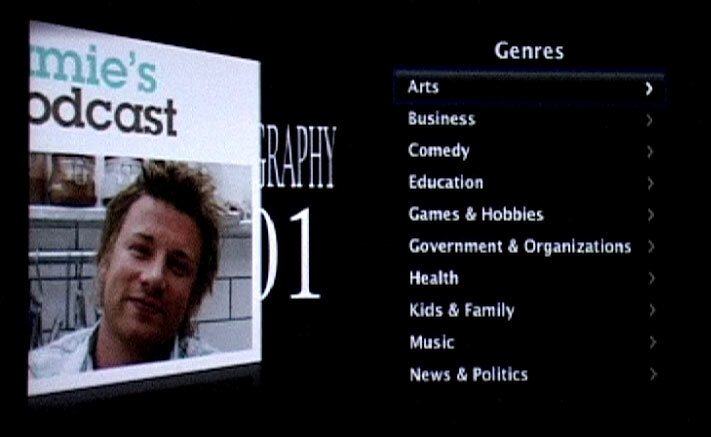 In the AppleTV interface, you can find all of your podcasts in the Podcasts, and then My Podcasts. 4. All your podcasts are listed, with blue dots to signify there are episodes you have not watched or listened to. Clicking on an episode will play the episode. 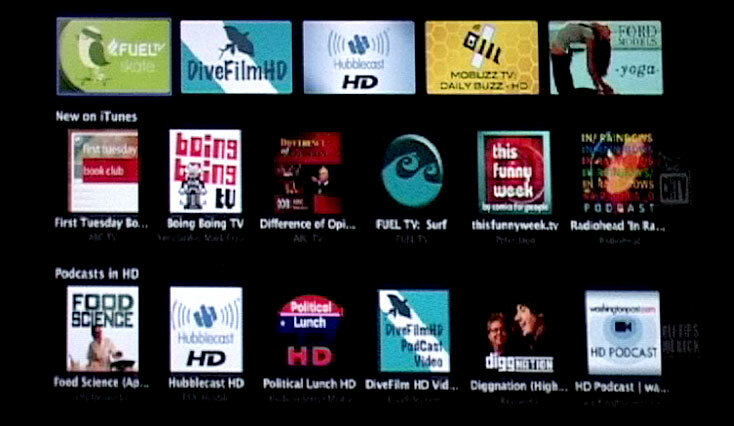 On this screen there are several rows of podcast thumbnails, grouped by Featured, New Releases, Favourite HD podcasts, Cartoons, Action sports, and others. These groupings change depending on which iTunes store you are in, but generally there will be a featured, top and HD list at least. Next on the list is Genres. As the name implies, this invoves browsing the collection by genre. I found this rather cumbersome, given how many podcasts are out there, but always a handy way of trying out new podcasts. Selecting a genre reveals a tier of podcasts similar to the top podcasts section, except this time narrowed only to that particular genre. This is a cool section, though a little short at the moment. 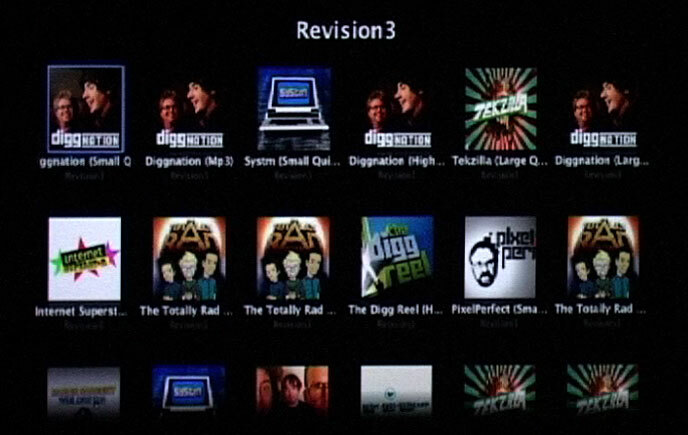 CLicking providers reveals a list of featured podcast producers, such as CNet, ABC TV and Revision3. Selecting a provider reveals a tiled page with all their podcasts listed. 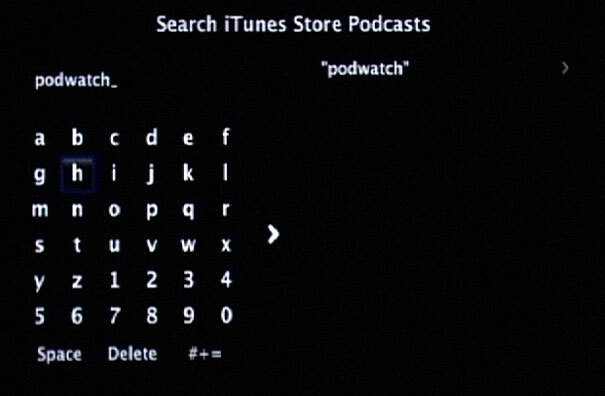 If you’re looking for a specific podcast, you can search for it using the cubersome, but handy, search feature. And now the best bit: downloading the suckers! 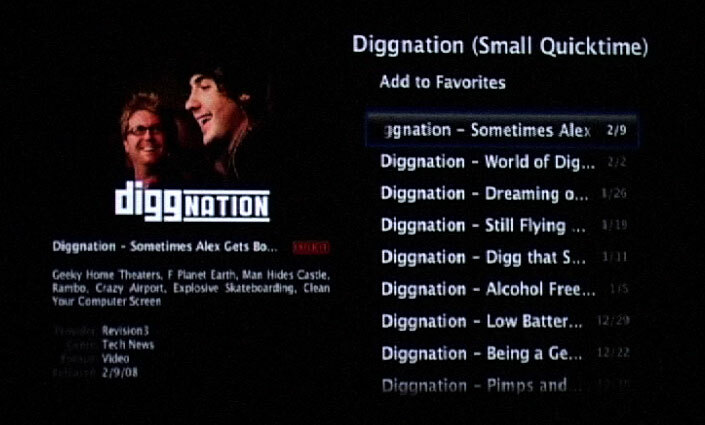 Let’s say I wanted to download Diggnation. I would first find them either by searching or browsing. If your iTunes store is set to USA, you will find Revision3 in the Featured Providers (if you’re like me and outside the USA, you can change the setting in the Settings menu. This, incidentially, is a great way to discover new podcasts from overseas). Then click either Play to play as a progressive download, or hit the Download button to download it to the My Podcasts section for later viewing. Notice, too, there is a handy “Viewers also watched” strip down the bottom of the screen. A nice touch! For podcasters, this is very exciting, as it puts us on par with TV and movies. In fact, I would go so far to say it puts us above TV and movies, seeing as the majority of the world can’t download TV or movies from the iTunes store. Much like when the iPod 5G was released we saw a significant rise in demand for video podcasts, AppleTV 2.0 could boost podcasting awareness overall. I still don’t think this iteration of AppleTV will be a huge success simply because of the limited market, but it definately won’t be dying anytime soon as many predicted. 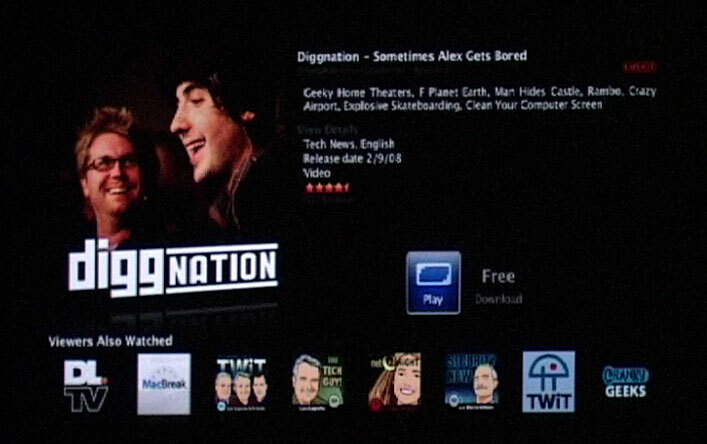 This entry was written by podwatch and posted on February 13, 2008 at 3:40 pm and filed under Hardware with tags Apple, AppleTV, take 2, update. Bookmark the permalink. Follow any comments here with the RSS feed for this post. Post a comment or leave a trackback: Trackback URL.